Gutters aren’t exciting; however, they serve as an integral part in protecting your home from water damage. We suggest cleaning and flushing out your gutters and downspouts at least once in the fall and once in early spring. The collection of leaves and other natural debris is the number one reason for the failing of gutters. Moreover, improper sloping can also clog gutter systems, resulting in a back flow of water to the inside ceilings causing Sheetrock damages. 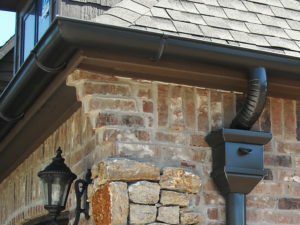 We offer many different styles of gutters and all sizing to meet your needs from 5” and 6” K style Gutter to 7” Box Commercial Gutter, as well as Half Round Gutters with the popular round downspouts. We offer a two year warranty on all drainage and leaks for your protection. Mesh or Screen leaf guards simple snap onto the gutter. Any type of tiny debris small enough to get though it will easily flow down the downspout. This is one of the cheapest ways to protect your gutters from leaves and big debris that can clog them. Solid Covers are just what they sound like. They fit and work really well. With one of these over your gutter, all leaves and debris will go right off the side. These required very little maintenance and are usually more expensive. 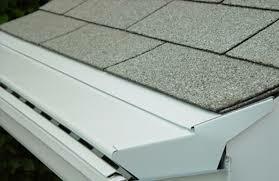 These gutter guards lay on top of gutters and shingles. They can be hinged or locked on so they do not shift. These will keep all debris out while allowing in water. These guards are one of the hardest to install, but at clean up time they just flip open, make cleaning them out a breeze. These are a little more expensive, but they are more durable that most of your other options. The only down side to these is that there is basic some maintenance necessary. You just have to clean some debris from your gutters from time to time. Our best seller of Solid Gutter Guard Systems is the LeaFree Gutter Guards. 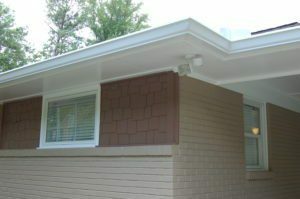 The leaFree guard has the highest water capacity of any gutter protection system. It also has a low profile design and can custom fitted to any home by adjusting it to any pitch of the roof. These come in an assortment of 15 colors. 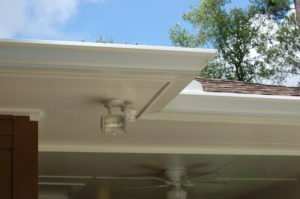 The EZ Gutter Screen is still one of the most versatile on the market today with two different methods of installation. 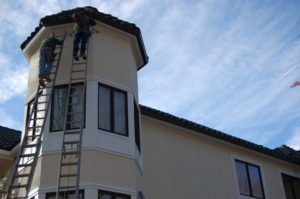 It can either be snapped into the front of the gutter for quick and easy removal without disturbing the shingles (EZ Regular), or it can be fastened with screws in the front of the gutter under the shingles (EZ Under). These come in many styles from mill finish to black powder coated and are available in 5”, 6” and 7” widths. It’s always a good idea when replacing your roof or installing gutter guards to consider replacement of your gutter system because it allows you to make the best design system for your Gutter Guard installation, as determined by your debris load and the pitch of your roof. New gutters complement your new roof functionally and aesthetically, while simultaneously protecting your home from water damage. These systems work together to provides a serviceable system for years to come. To avoid gutter problems, Westbrook Home Remodeling will be happy to discuss all of your gutter options with you. To get started, give us a call at 770-466-4681 or fill out our estimate request form to get a free quote on a new Gutter System or Gutter Guard system.